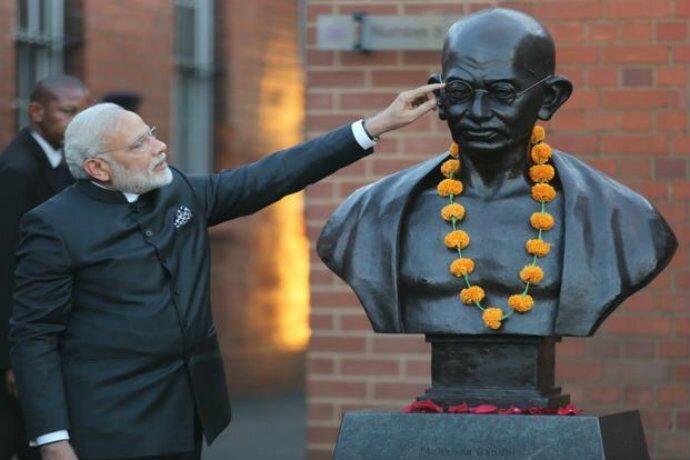 It’s the 150th birth anniversary of Mahatma Gandhi, and the government has planned a dozen events across the globe to promote the khadi-clad, bespectacled, slightly stooping, yet towering personality. The celebrations, as reported, will last a whole two years. Yes, that does goof-up the math there, but we’re not complaining. Simply because he is the father of our nation. At least that’s what we’ve been taught in school. Just as we learnt that a ‘salt’ debt is the heaviest of them all. And the Mahatma gave us the said — salt. Which is why we must never forget him, or what he stood for. So, what did he stand for? That’s where we’re all stuck — the most widely used token of nationalism to further any and every political agenda, did he truly belong to a particular political party? We don't quite know. But we do know this. The Mahatma was a Gujarati. For the Bharatiya Janata Party (BJP), all that matters is that Mohandas Karamchand Gandhi was born in Gujarat. At least, that seems to be enough for PM Narendra Modi, who has no qualms endorsing Gandhi’s legacy (and that of Sardar Vallabbhai Patel, also born in Gujarat). The Prime Minister launched one of the BJP-led NDA’s biggest schemes, the Swachh Bharat Abhiyaan, on Gandhi Jayanti, in 2014, which seemed an extension of Gandhiji’s emphasis on cleanliness and sanitation. Another of his schemes, Make In India, is uncannily similar to Gandhiji’s Khadi movement — both promoting things made exclusively in India, by the people of our country. But nothing comes close to Modiji’s speech at Parliament, where he admitted that a ‘Congress mukt Bharat’ was in fact, Gandhiji’s vision. The Mahatma was a Gandhi. The Congress and the BJP’s war about the icons is iconic. 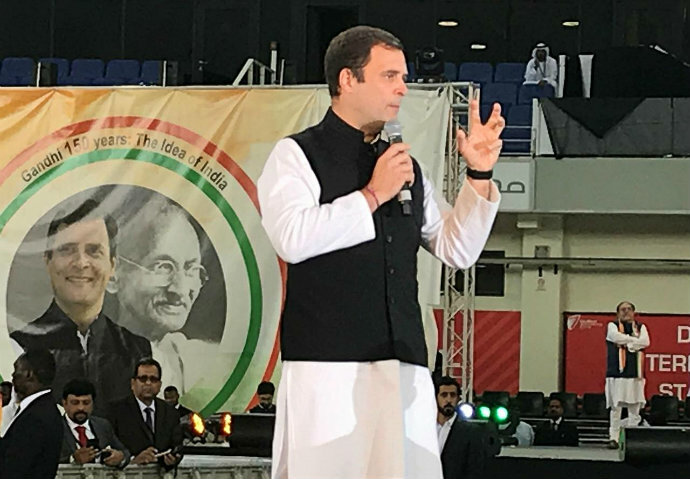 The Congress has accused the BJP of ‘usurping’ their leaders — read, Sardar Vallabhbhai Patel, BR Ambedkar and Subhash Chandra Bose — but when it comes to the legacy of Gandhiji, the Congress seems to give the BJP enough rope, perhaps hoping that they will hang themselves. He is a Gandhi, after all. Need we say more? Besides, Modiji can’t even get the name right — didn’t he refer to Gandhiji as Mohanlal, instead of Mohandas? Ouch! 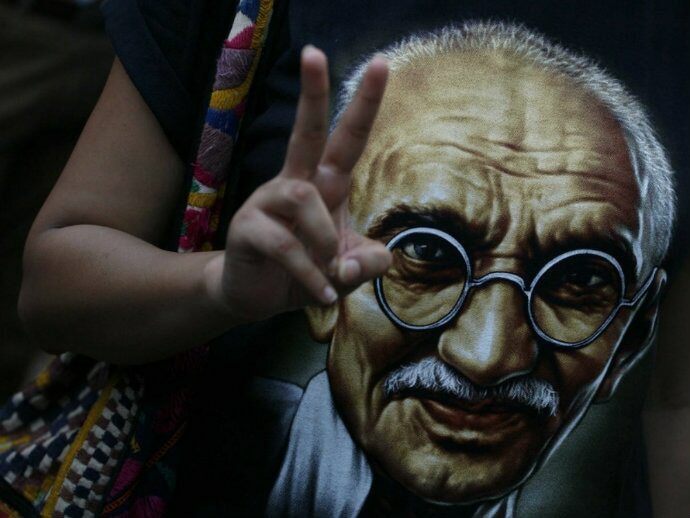 The Mahatma was a satyagrahi. While these two fight it out, Eastern India interprets Gandhiji differently. If food is the biggest driving force for humans, deprivation must be the ultimate sacrifice. Therefore, a hunger strike — or Satyagraha. 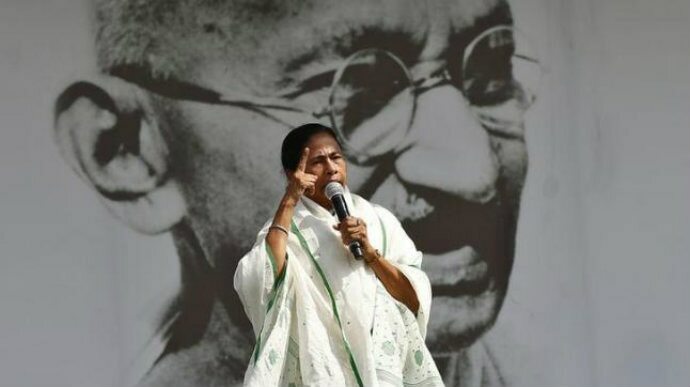 If there’s one person after Gandhiji who has made satyagraha popular, it is Mamata Banerjee. No, not Anna Hazare, not even Irom Chanu Sharmila. Back in December 2006, Mamata made headlines for her 25-day long hunger strike. At the time, she was fighting for Shingur, against the-then ruling party in West Bengal, the CPI (M). Headlines were also made because she broke Gandhiji’s record of a 21 day-long fast. This time too, Mamata plans to continue Satyagraha till the country is saved. She, quite like Sheldon Cooper, will not budge. In all this, we wonder what the Mahatma is up to wherever he is. Perhaps in this saffron vs green tug of war, he wants to go pink.